As women age and they go through menopause, they suffer a wide range of side effects associated with this period in their lives. Hot flashes, night sweats, mood swings, depression and many other affect women’s lives and decrease their quality of living. Taking herbal remedies can help alleviate these discomforts and there is quite a tradition in treating menopause symptoms in a natural manner. Many of these remedies are now used by manufacturer of health supplements, and Source Naturals Menopause Multiple is just one of these products. Let’s see together what this menopause supplement is really all about. 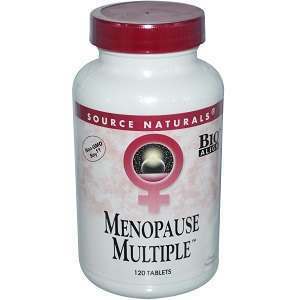 What Does Source Naturals Menopause Multiple Contain? As you can see, the list of ingredients for this specific product is quite long. We notice the use of many herbal extracts, which is a great thing, so Source Naturals Menopause Multiple may offer great support for overall health and for reducing the symptoms of menopause in women. The recommended dosage is two or three pills taken twice every day with food. 30 tablets are sold for 10.25USD, 60 tablets for 18.98USD, and 120 tablets for 35.98USD. We did not see any clear money back guarantee offered on the manufacturer’s website, so you may need to contact them directly for any additional info on the matter. Source Naturals Menopause Multiple is a solid product, with many herbal extracts, vitamins and minerals included in its formula. It may help women’s health, as they age, as the added nutrients are very useful for maintaining a good physical condition. Jackie Horowitz	reviewed Source Naturals	on April 9th	 and gave it a rating of 2.